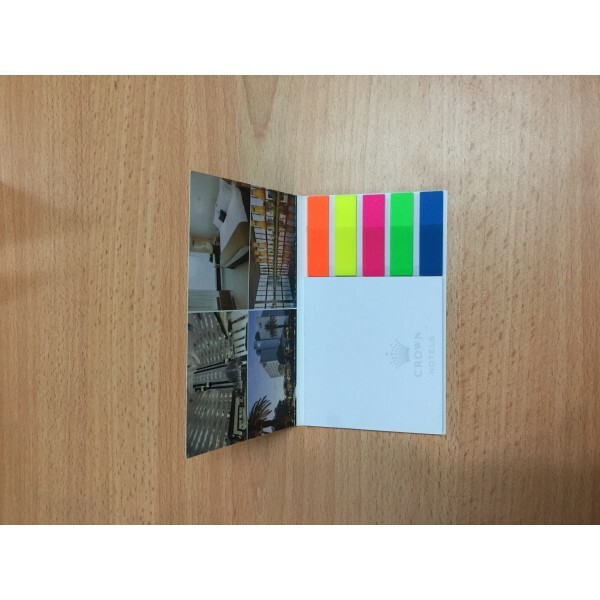 Buy combination sets of sticky notes personalised with your graphics and logos. Amazing for promotions and events. Print on both sides of the cover is available at an additional cost. 50 leaf 70 x 75mm Stuk Note pad. Set of unprinted film markers five standard colours x 25 leaf. Made in Australia. Delivery all around Australia direct to your door. Turnaround time is 2 weeks from order placement. Please supply your desired print artwork in an EPS, PDF or Adobe Illustrator format for best custom printing results. For a larger writing surface consider our A4 sized custom branded lecture notepads.